« CardDroid Math 2.6 is here and it’s HOT! 1. Tap “Settings” from the main screen. 2. Tap the “Customize Problem Set” button. 3. 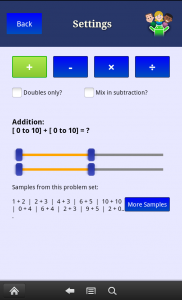 Tap the “x” button at the top of the screen for multiplication. 5. Drag the boxes on the bottom slider to the number range you want (for example, 2 through 12). 6. Tap back and it’s set! You’ll see example problems on the screen. You can adjust it until it’s exactly what you want. Your question or tip could be featured here. Share your question or tip on our contact page or our Facebook page or tweet to @WhitneyApps Twitter. Have fun and great learning in 2013! This entry was posted by Steve on January 3, 2013 at 4:09 pm, and is filed under post. Follow any responses to this post through RSS 2.0. You can leave a response or trackback from your own site. Victoria Rule liked this on Facebook.